This project is an effort to reinstate the passion of passenger travel originally associated with the civic-scaled railroad terminals of the early twentieth century. Major projects such as Grand Central, Penn and Union Station celebrated the arrival and departure of the rail traveler and at the same time represented a gateway to the metropolis. The Satellite D Gates aspire to that earlier ethos, moving passengers through civic-scaled spaces in a structure that overtly expresses its function as a destination airport terminal. Any passenger terminal must respond to two significant passenger movements: arrival and departure. Passengers arriving in the Satellite D terminal are organized by double height clerestory center bays, which direct passengers to the central hub of the terminal. Here they encounter a condensed version of the Las Vegas Strip, the “Air Strip”, which curves around the central portion of the facility, leading to the Great Hall. The Great Hall bisects the terminal hub, straddling the lower level Rotunda and (in the opposite direction) overlooking the airfield through a large freestanding window wall. The junction between the Great Hall and the escalators leading down to the Rotunda Floor features a neon gateway reminiscent of the classic “Welcome to Las Vegas” sign of the 50s. The floor of the Rotunda features a cast terrazzo recreation of the Las Vegas air map allowing passengers to recreate their arrival into the city. 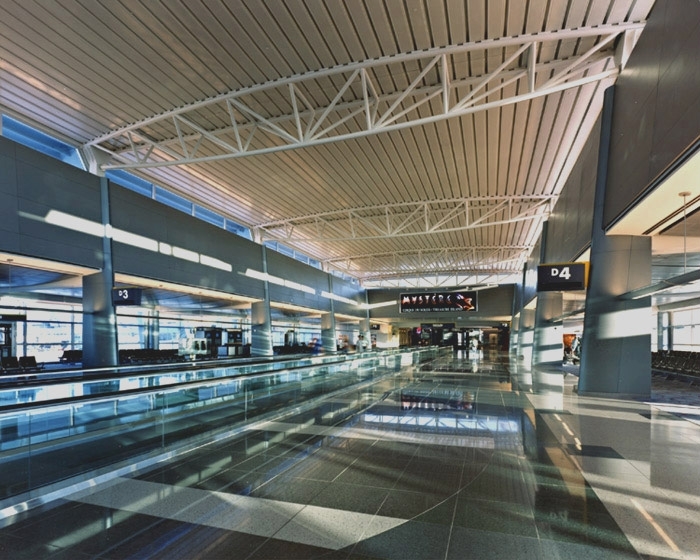 As travelers move across this floor to the airport transit system station, they can locate their ultimate destination within the valley. Departing passengers, however, experience this sequence of events in a different fashion. Passengers arriving in the station are presented with tile murals of 16 major cities. Each mural design was the product of a local elementary school class and represents the excitement of a distant destination. Crossing the rotunda to the escalators, the Great Hall ceiling soars overhead with a profile similar to the flight path of an aircraft at takeoff. At the top of the escalator the rising arc of the Great Hall culminates in a large window which focuses on the point of take-off for departing planes.